Świetny izolat, idealnie się rozpuszcza i smaki są bardzo dobre. bardzo dobre białko. idealna rozpuszczalnosc, nie pieni sie i wybor smakow jest duzy. Cena moglaby byc troche nizsza ale wyroznia sie na tle tych tanszych bialek wiec moze to przebolec. POLECAM! Mix 1 serving (25 g, 1 measuring spoon = 2 heaped tablespoons) with 200 ml water and drink twice a day. A perfect protein supplement to be used during reduction period and low-calorie diets, when we have to pay attention to the amount of carbohydrates and fats. 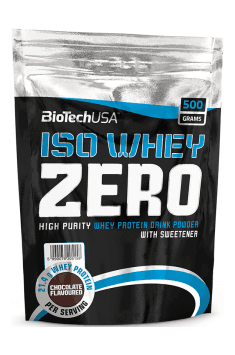 It works most efficiently when used immediately after training and as supplementation of meals with low protein content. Energizing vitamin-mineral formulation. It increases immunity, improves mood and well-being. Multi-component product allowing muscle growth. Contains prohormones. A complex of of vitamins and minerals from green tea. It protects the joints, supports digestive and immune systems.